Just one more person mouthing off. We made cornbread, now we’re going to turn it into a Holiday stand-bys. *to taste because some people like these things and others HATE them. **gluten-free soups are available or try this alternative: Cream of Anything Soup! Make your pan of cornbread and let it cool. Boil your turkey thighs and allow thighs and broth to cool. De-bone thighs. Slice and dice your veggies to sizes that you and your loved ones like. Add cans of soup, eggs, salt, and pepper. Mix it all in a huge bowl with enough of the broth to make is pretty wet but not soupy. Pour into a lightly oiled casserole dish (save back about four cups of mixture for a separate smaller pan). Pop them both into the oven at 375 degrees until golden brown and firm. When your Turkey Dressing is done, dish all of the smaller pan (four cups) of dressing into a sauce pan and pour the extra broth over the top. Stir in corn starch and cook low until nice and thick. This is the best turkey gravy you’ll ever try. 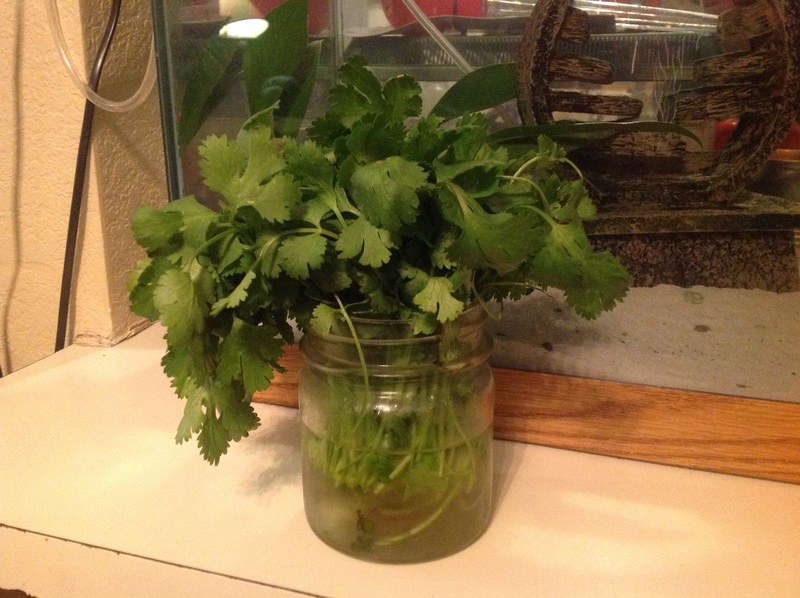 If you read the earlier post about putting the wilted cilantro in water, you know that I found that it survives better in the frig when you put the stems in water. To add to that post is this new info: Cut the brown withered stems before placing them in water. Also, if you want to start cilantro in your window, according to the internet you can put them in water on the windowsill and they will develop roots. What am I out? $.30? I’d like to point out to those of you who haven’t thought about it, that I’m actually saving a lot of money by growing my own herbs in the window. Sure it isn’t much at this point, but it adds up really quickly, especially if you’re buying the fresh herbs instead of the dried ones. For me, that money goes for any number of things, but if you don’t have anything to spend a little extra money on, far be it for me to tell you how to save a buck. But inside the house, my garden is growing happily in the kitchen window and in the living room window as well. 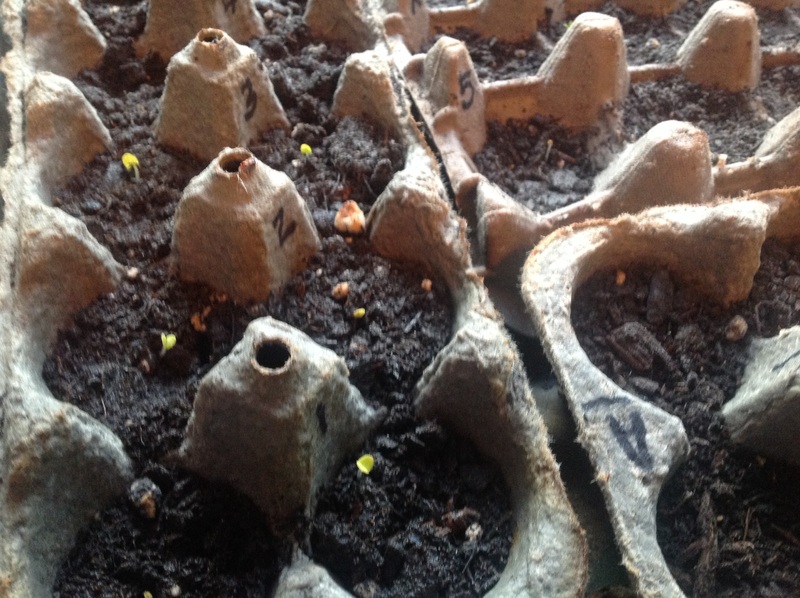 A couple of weeks ago, I filled cardboard egg crates with soil. Then, I added seeds and a handful of hope. I have lil’ sprouts! I told a couple of friends at work about this venture and got looks of amazement. They all acted like I was doing something amazing, which on the one hand I am and on the other it’s the most natural thing in the world. There are so many people who limit themselves with things like “I could never” and “I’m not that talented”. For that reason, they become bitter and unhappy as the people around them test themselves and expand their horizons. Don’t be one of those people; instead try something new! Not all of my seeds have sprouted yet, but I have high hopes and if they do, I’ll add lemon balm, lemongrass, tarragon, savory, a new type of basil, and thyme to my indoor herb garden. About the time I turned six years old, I started packing on the pounds despite the fact that my activity and food consumption hadn’t really changed. My parents did nothing except tell me I was just eating too much. This was followed by everyone telling me that I was fat, ugly, etc. Long story short, I kept gaining and thought they were right. Then my sister who had done exactly the same thing, was diagnosed with a thyroid problem. I started reading up on thyroid and realized that I had most of the symptoms. Problem was that when I got my numbers run, they were normal. I started self-treating the symptoms with l-tyrosine and iodine. I lost sixty pounds and got pregnant. (Thyroid can make you sterile. My ex and I had tried for years to have a kid.) During my pregnancy, I gained all the weight back plus some. This year, I found a book that told me about a disease called Hashimoto’s Disease. 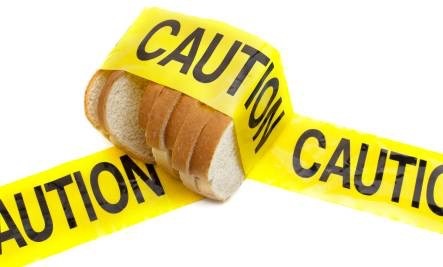 Basically, a food intolerance causes your body to freak out and start attacking your thyroid, slowly destroying it over time, which causes thyroid symptoms. The book also suggested going gluten-free as a way to control the disease. Cappy and I decided to give it a try. For a week, we cut most of the gluten from out diet. That one week sold both of us on the benefits. We saw a reduction in joint pain, food consumption, and most importantly for both of us… Our low blood sugar issues went down significantly. As a side note, if my story sounds familiar and you would like the name of the book, simply send me a shout and I’ll respond as soon as I can. 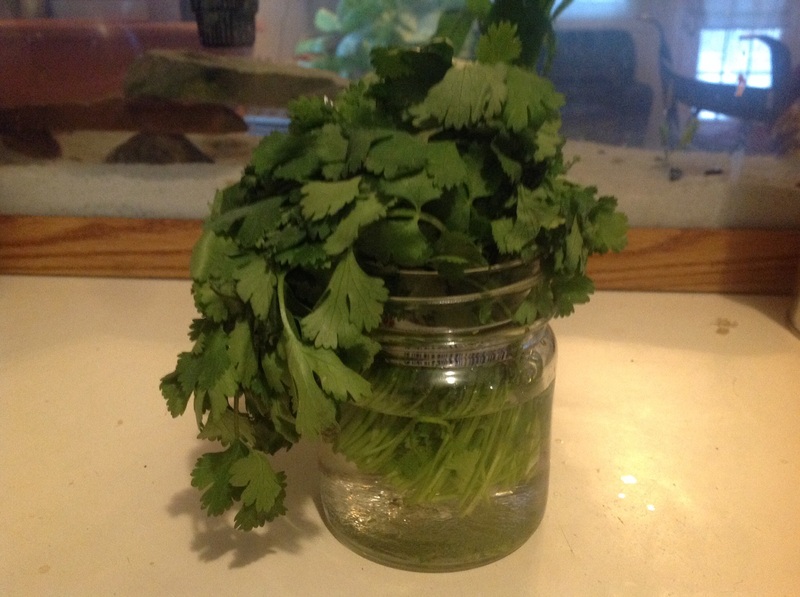 So I was just cleaning out the refrigerator when I came across this pitiful bunch of store-bought cilantro. I started to throw it away and then stopped myself. I saw on some website or another that you can stand greens up in a pitcher with a little water in the bottom and they will stay fresh a lot longer in the frig. Hmmm…. Would the same trick save this little bunch of herbs? There’s only one way to find out. So I lopped off the ends and stuck them in the jar with a little water. I’ll update this post when I have results. If a picture is worth a thousand words, here you go! Twenty-four hours later, my poor wilted cilantro isn’t great, but it is a lot better, which bodes well for the next bunch that I buy. That is if I can’t get it to regrow like a recent article I read suggests. 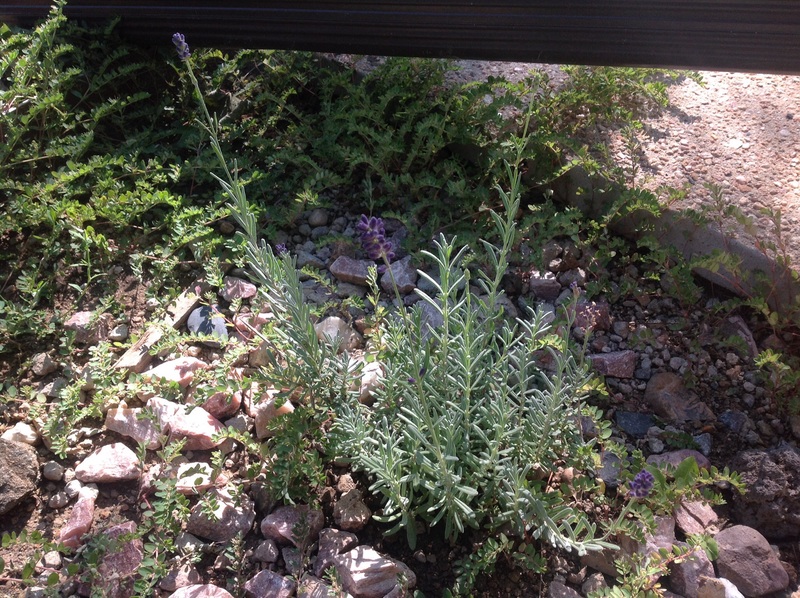 Someone forgot to tell my lavender that the old saying is: the first year new plants sleep, the second year they creep, and the third year they leap. This started out in a four inch container. It is now roughly three times the original size and despite the first frost, it is still growing and blooming. I wonder if the aquarium water I’ve been pouring on it every couple of weeks has anything to do with it. I’d guess so. 1. I love plants in the house. They make a house more welcoming in my opinion. 2. I love to cook, but am a snob about my herbs for said cooking. 3. 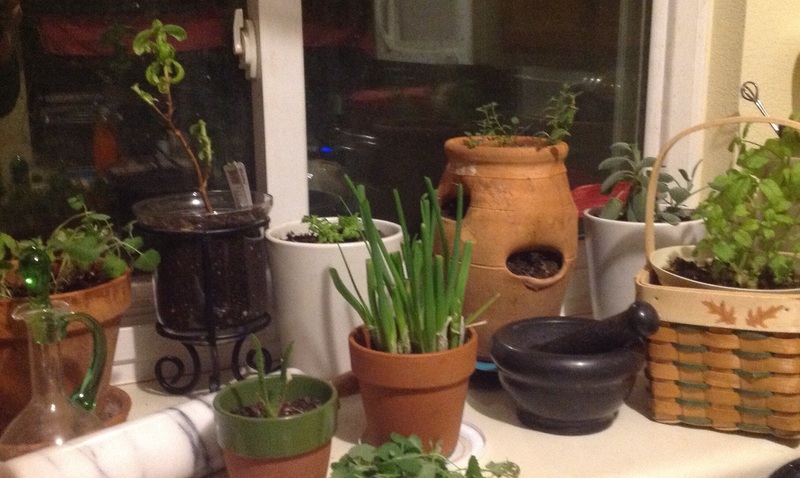 I have always loved the looks of window herb gardens. 4. I had the perfect south-facing window. I just had to try to do herbs in the window. Then it was a container garden. Now I’m up to raised beds and eyeing roto-tillers. I’ll warn you now, gardening is addictive. It is also highly rewarding. There is nothing like my homemade marinara made with herbs from my garden. I’m not an expert and I’m not claiming to be one. What I am is someone who is trying, failing, trying again, and eventually succeeding. Come along and let me show you what I’ve got so far.